It is a shame that we finally get to see “The Wolverine” as he was intended to be, but struggling with his powers since his time has finally come...it would have been nice to see one more film with Hugh Jackman in his full glory as Wolverine (and an R rating) before getting to this story. Seventeen years ago, Hugh Jackman (The Prestige) commanded the screen as the brooding, mutant Wolverine in the movie X-Men. We've seen his story evolve, as he becomes a reluctant hero while battling the demons of his past. He resists Charles Xavier's (Patrick Stewart; Star Trek: The Next Generation) assistance, yet aids the group in battling endless numbers of adversaries. He has been a part of the X-Men series as well as having his own stand alone films. His final story, Logan, has come to 4K Blu-ray so audiences can once again enjoy the character we have watched for almost two decades. Based loosely on the "Old Man Logan" comic book series, as Logan opens we are introduced to an older, surlier, drunker Logan trying to make a living as a limousine driver in a post mutant world. He protects an ailing Charles Xavier, a wanted man, by keeping him locked away in an old metal water tower south of the border with the help of another mutant, Caliban (Stephen Merchant; Table 19). Logan deals under the table with medical personnel to get Charles the medications he needs as mutants are now underground and dying out in this vision of the future. More of a western than your typical comic book film, director James Mangold (The Wolverine) takes Logan to a place in comic book lore that few have visited before, other than Deadpool, Dredd, and Blade. Like these previous movies, Logan is an R-rated comic book film, made more for adults than young adults and teenagers. This film is bloodier and more violent than most of the typical comic book movies we are accustomed to seeing. Logan also introduces to the world newcomer Dafne Keen (The Refugees) as the lab-grown Mutant X23 or "Laura". Initially reluctant to help Laura, Charles eventually convinces Logan that they must keep her alive and out of Government hands. Unfortunately, this means being chased halfway across the country so Laura can reunite with others like her so they can find sanctuary. The films main focus is Logan's developing relationship with Laura and certainly adds to the emotional draw of the film. The 4k UHD Blu-ray combo pack includes four discs, two 4k discs, as well as two 1080p Blu-ray discs containing the film in its full-color version as well as a black and white "noir version". The noir Logan is intriguing to watch as it gives the movie an entirely different feel than the full-color one. Of course, the special effects of the 4K version is fantastic and with incredible video and audio quality. The movie is presented in 2160p high definition video with a 2.39:1 aspect ratio with a picture quality that is simply amazing! The blacks are spot on, the colors are a bit washed up, but on purpose to portray the "western" motif, and the "Logan Noir" 4k video is crisp and clear and looks better than any other black and white film ever created (including the Mad Max: Fury Road black and white transfer) The Dolby Atmos audio truly packs a punch. The dialog, relegated to the center channel, is crisp and clear. The special effects are effectively separated from the other channels, with a western style score by Marco Beltrami (World War Z) that never overpowers the rest of the audio. 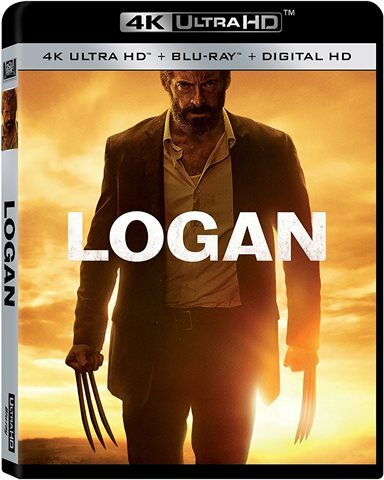 Besides the black and white version, the combo pack also has audio commentary with Mangold, deleted scenes and Making Logan. The last is a behind the scenes look at the film that it broken down into several featurettes and, in its entirety, runs over an hour in length. It is a shame that we finally get to see "The Wolverine" as he was intended to be, but struggling with his powers since his time has finally come. While it would have been nice to see one more film with Hugh Jackman in his full glory as Wolverine (and an R rating) before getting to this story, Logan wraps up Wolverine's story with a bloody bang, fitting of the conflicted anti-hero. Download Logan from the iTunes Store in Digial HD. For more information about Logan visit the FlickDirect Movie Database.